Hey guys! 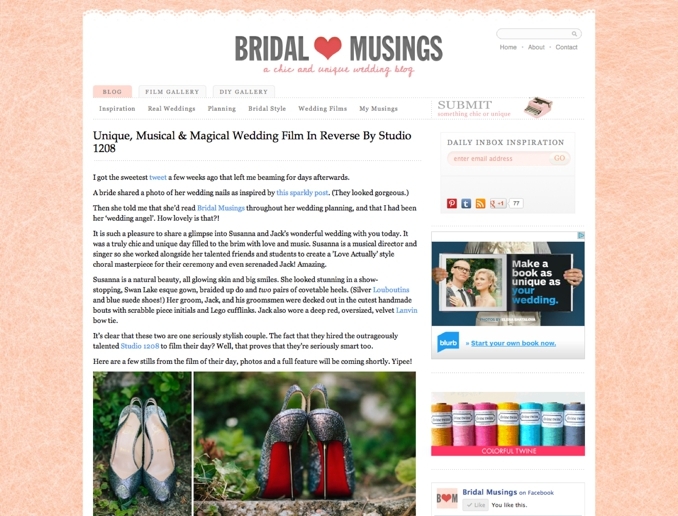 So excited that today we are being featured on one of our favourite wedding blogs! Elizabeth at Bridal Musings was nice enough to want to feature Jack and Susanna's gorgeous wedding, and if you haven't seen it already, you MUST watch it! I think Nick really out-did himself with the editing of this one - it is SO special! And, I also must say, that I am so proud that I worked on this one with him in the shooting department. I have really fallen in love with shooting video - it is soooo much fun to see my images move! Anyway, pop on over to Bridal Musings, and leave us some love in the comments box if you like what you see - or, just leave us some love in our comments box. We LOVE to hear your feedback!!! Click here to see the full post over at Bridal Musings!